Seoul has several different traditional markets that all have its own unique flavor. Young or old (mostly old), hundreds of people gather to sell/buy goods. When you enter these markets, you really begin to get a feel of what Korea was like in the past. These parts of Korean culture have been preserved and left untouched, at least in comparison with the modernization that has taken place all across Seoul in the past 60 years. You will hear Korean ahjummas loudly bargaining with customers, smell the aroma of tteokbokki (spicy rice cake) and soondae (pig intestines), and get a genuine feel for Korean culture! The editors of VisitSeoul chose our personal favorites from the markets and talk about them here. Don't underestimate these tiny little scrubbers. Although they may look fairly harmless, serious damage can be done. This is actually a Korean version of a loofah that has extra rough ridges meant to attack that dead skin. Many Koreans can tell you that they grew up with their mothers vigorously scrubbing away at their backs. Koreans tend to do this on a weekly basis for soft, clean skin and healthy blood circulation. Spend 2,000 won on this tiny litte scrub and have yourself some nice skin. Be careful not to do over it though! These scrubs can typically be found at Namdaemun. Professional Body ScrubHead on over to the nearest 찜질방 (Korean sauna) and ask an ahjumma there for a professional scrub! Get ready to have your personal space be invaded. Cost: the price varies but expect to pay around 20,000-30,000 won (around USD 20-30). If you don't want to weigh your luggage down with heavy souvenirs, you should definitely include "gim" (김) on your list. Didn't think that seaweed from the ocean could taste good? Get ready to be proved wrong! Gim is made by toasting seaweed with sesame oil and salt: a delicious end product. It is loved by many Koreans and considered a staple banchan (side dish) on the dinner table. In fact, gim is the very thing that is used to make "kimbap", the Korean version of maki that we all know and love. Gim usually comes in packages of 6, 10, 12, or more. Look forward to your pre-cut squares of salty, oily deliciousness! Gwangjang market carries a huge variety of different kinds and flavors, including bulgogi(beef)-flavored gim (as pictured below). How to Eat "Gim" in a Simple WayFirst, pour some soy sauce into a small dipping dish and add just the right amount of sugar. Then, take a small ball-sized chunk of hot, steaming rice and place it into the center of the cut out square of gim. Roll it up and dip it into the sauce. Pure bliss! These tin pots let you have food more instantly because they are thin, light, and thus easier to heat up. They are extremely cheap and efficient. When you watch Korean dramas, a lonely, single boy or girl who lives by themself might very well be eating ramen out of this kind of pot. There's something about eating in this kind of pot that makes the ramen taste more delicious. If you are all about having that authentic experience, be sure to pick up a bowl to eat your bibimbap (비빔밥). These special stone bowls allow bits of the rice to become a little crunchier and also keep the food piping hot for a good few minutes when served to customers. Korea is the only country that uses metal chopsticks and you would be surprised to know that this invention goes WAY back. Simply put, they're more hygienic, durable, and contribute to your brain development (metal chopsticks are harder to master). 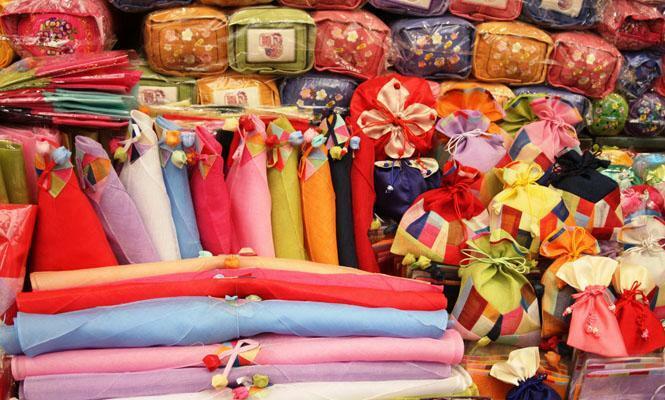 Hit the markets and you will find that they carry a diversity of different designs and looks. ★ You can find most of these items at Namdaemun or Gwangjang Market. Tin Pot- Use the Lid as a PlateIf you do end up eating ramen out of the tin pot and you don't want to waste time doing dishes, use the lid as a plate! In other words, this is the perfect pot to take camping. Less dishes, more convenient. In addition to the hanboks, there are also several places that sell regular clothes and other trinkets for kids. Becoming a fashionista at a young age is not a bad thing! Changes with Time As the times have changed, so have hanboks. Google "modern hanboks" to see the coolest designs and how these elegant fabrics have been incorporated into today's trends. Honestly, this has got to be one of the best snacks of all time. Chewy, flavorful, and sweet. How can you not love it? Rice cakes come in a variety of different flavors and textures. Some of the most common ingredients include red bean, dried fruits, sesame seeds, sugar, and beans. Some even contain a sweet liquid that gushes into your mouth as soon as you take a bite. If you want to experience these plump pieces of happiness, head on over to the traditional markets (typically, most markets carry 떡). Eat it right away! Once you've bought these delicious goodies, don't let too much time pass or the rice cake could eventually harden. They should be enjoyed as soon as possible. Ginseng has the tendency to scare some people away because let's be honest, it kind of looks a little weird. It could be mistaken for an organ or a deformed looking hand, especially since it is often stored in tall jars with orange-y liquid. Also, for the younger folks out there, one is not necessarily dying to get their hands on some ginseng. But, since the topic is traditional markets, ginseng cannot be excluded. Ginseng is actually a really valuable item that is sought out by many and these markets offer significantly lower prices than department stores or supermarkets. Check out Gwangjang market for a broad range! Flavor enhancer/ Gives you a boost in energy/ Lowers blood sugar levels. Tip: Look for ginseng that is more firm rather than the soft and pliable ones.